Using the Touch, Shape, Move Guitar Method, the Hidden Sounds Series includes a Quick Reference for beginners, a section on the History of the Guitar, and a Glossary. Every chapter offers a brief history of the technique in question, an explanation of how to perform the technique, a series of examples and excerpts from original pop, rock, jazz, folk and world music compositions that demonstrate the practical use of techniques, and, finally, a challenge for the guitarist to expand these exercises and make them their own. Books 1 - 3 include audio files to follow along with. Note to dealers: These audio file are meant to be used in conjunction with the first three books of the Hidden Sound Series. They are free for you to download and offer to customers who buy each of the books or the entire series. 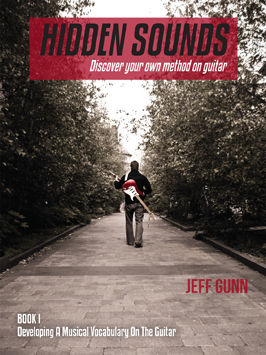 "The Hidden Sounds series by Canadian composer and guitarist Jeff Gunn has the most to offer out of any guitar book series I've gone through in my ten years of playing. Rather than going through boring scales and repetitive work, Jeff teaches you how to find your own musical spirit and voice through fun exercises and using your own imagination. I would definitely recommend the Hidden Sounds series to any player and any level from beginner to guitar guru. There is something to be learned from Jeff no matter what level you may be currently playing at. Amazing! And that's the bottom line!"